KATHMANDU, March 15: In what appears to be an indication of the revival of service sector, credits from bank and financial institutions (BFIs) to this sector in the first half of Fiscal Year 2016/17 jumped by 11.9 percent. Total outstanding loans and advances of the BFIs to the service sector now stands at R 141.68 billion, thanks to 11.9 percent growth in credit expansion or rise in lending by Rs 15.11 billion, according to statistics released by the Nepal Rastra Bank (NRB). 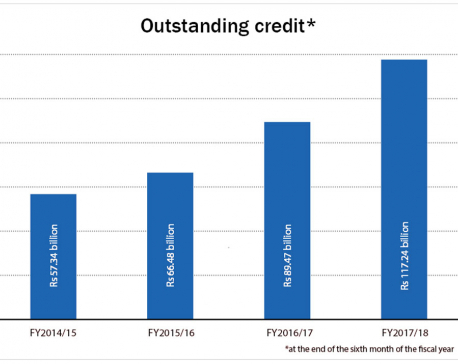 Such credit growth in the corresponding period of the last fiscal year 2015/16 was only 5 percent, or Rs 5.36 billion. Earlier in mid-January 2016, the total outstanding loan of the BFIs to the service sector was Rs 113.35 billion. The hotel industry -- a subcategory lumped under the service sector by the central bank in its sector-wise breakdowns of outstanding credit of BFIs -- alone saw a 16.4 percent, or Rs 6.56 billion, growth in credits. In the corresponding period of the last fiscal year 2015/16, credits to the hotel industry had increased by Rs 3.45 billion to Rs 33.56 billion. Similarly, lending to tourism industry also grew by 6 percent, or Rs 689 million, over the first half of the current fiscal year. The total exposure of the BFIs to this sub-category, which includes trekking, mountaineering, resort, rafting and camping, among others, stands at Rs 12.17 billion as of mid-January. Advertising agency was another sub-sector which saw the highest growth of 37.5 percent with total outstanding credits reaching Rs 1.41 billion as of mid-January. Lending toward educational services rose 7.4 percent, or Rs 2 billion. The total outstanding credit of the BFIs on educational services is Rs 29.13 billion. Likewise, loan flow of BFIs toward health service posted a growth of 7.4 percent, or Rs 1.56 billion, to Rs 22.58 billion. Similarly, a total of Rs 313.2 million was added as loans in 'entertainment, recreation and films' sub-sector over the six months of the current fiscal year. BFIs expanded new loans of Rs 519.9 million in 'automotive services' and Rs 3.09 billion in 'other service companies', respectively, according to the central bank. The rise in credit flow toward service sector comes in the wake of the revival in service sector, particularly rebound in tourism activities, following the 2015 earthquakes unrest in Tarai which battered the hospitality industry. While existing hotels and restaurants are expanding their operations in recent months, some of new five star hotels as well as budget-class hotels are also coming up. “Despite shortage of lendable fund since the beginning of the current fiscal year, both the demand and expansion of credits to service sector has gotten stronger in recent months,” Anil Keshary Shah, the president of Nepal Bankers' Association, told Republica. “Entrepreneurs of tourism and hospitality businesses have become bullish about the future prospect of the tourism business. Many international hotel chains like Sheraton and Marriott are also entering the Nepali market which has also boosted confidence of the investors,” he added. Shah also attributed the rise of investments of the BFIs in the service sector, particularly tourism and hospitality, to the robust growth in domestic tourism. “There are many hotels and restaurants popping up in many places across the country to cater domestic tourists while international tourists are also going beyond the conventional tourism destinations like Pokhara and Chitwan for trekking in places of far western regions which have encouraged businessmen to make investment there,” he added. According to a regular report of the central bank on macroeconomic updates of the first six months of the current fiscal year, number of tourists visiting Nepal showed a growth of 35.4 percent to 729,550 in 2016. “A pick up in tourist arrival is expected to improve hotel and restaurant businesses,” reads the report.